If you read the HORROR REPORT other sources a few days back, you’ll remember the story and controversy of whether the Pope exorcised a demon from a man from Mexico.. 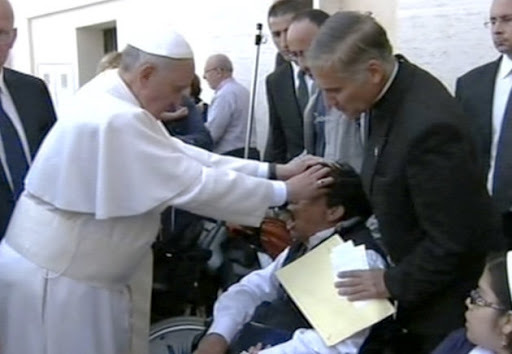 The video showed Pope Francis forcefully ‘blessing’ the then unnamed man, even holding his head down as the man exhaled loudly while the camera looked on. Immediately priests with expertise in the ancient craft of exorcising demons said that Pope Francis had performed the ritual.. The Vatican said no. Now the man has weighed in..It turns out that the man named ‘Angel V’ is 43, from Mexico, and claims to be possessed by demons.. Could he be wrong, too? Angel told El Mundo, “I still have the demons inside me, they have not gone away!” He recalled the very first time the demons entered into him, it was in 1999 when “I was returning home by bus from Mexico D. F. to my birthplace in Michoacán state”. He felt that “an energy had entered the bus. I did not see it with my eyes, but I perceived it. I noted that it came close to me, and then stopped in front of me. Then, suddenly, I noted that something like a stake pierced my chest and, little by little, I had the sensation that it was opening my ribs” It felt like a heart attack, he thought he would die. From that moment on, he said, his health started deteriorating: he vomited whatever he ate; he felt t pains in his whole body, as if he was full of needles; he began to have difficulty in walking, and breathed “I could not sleep, and when I managed to sleep I had terrible nightmares connected with the evil one”, he added. He began to fall into trances in which he blasphemed, and spoke in unknown languages. Medical doctors examined him and carried out tests but “could not get to the cause of my problems”, Angel said. Priests gave him Extreme Unction four times, but this only ‘relieved’ but did not remove his problem.